Numpy is going to be used to simulate data. I create a data set in which we have one factor of two levels (P) and a second factor of 3 levels (Q). As in many of my examples the dependent variable is going to be response time (rt) and we create a list of lists for the different population means we are going to assume (i.e., the variable ‘values’). I was a bit lazy when coming up with the data so I named the independent variables ‘iv1’ and ‘iv2’. However, you could think of iv1 as two different memory tasks; verbal and spatial memory. Iv2 could be different levels of distractions (no distraction, synthetic sounds, and speech, for instance). 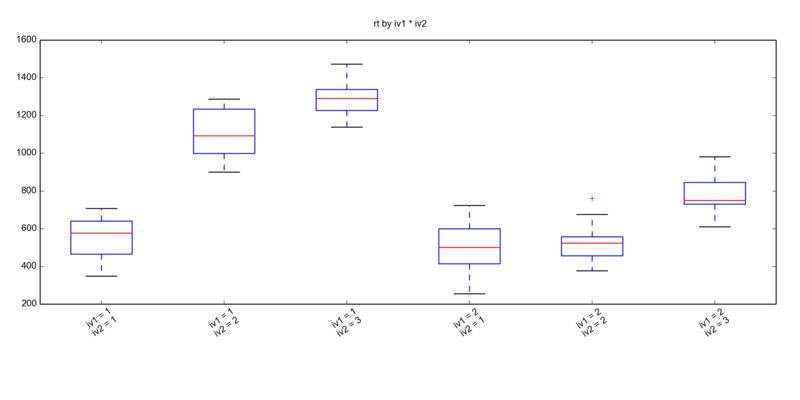 I start with a boxplot using the method boxplot from Pyvttbl. As far as I can see there is not much room for changing the plot around. We get this plot and it is really not that beautiful. To run the Two-Way ANOVA is simple; the first argument is the dependent variable, the second the subject identifier, and than the within-subject factors. In two previous posts I showed how to carry out one-way and two-way ANOVA for independent measures. One could, of course combine these techniques, to do a split-plot/mixed ANOVA by adding an argument ‘bfactors’ for the between-subject factor(s). The output one get from this is an ANOVA table. In this table all metrics needed plus some more can be found; F-statistic, p-value, mean square errors, confidence intervals, effect size (i.e., eta-squared) for all factors and the interaction. Also, some corrected degree of freedom and mean square error can be found (e.g., Grenhouse-Geisser corrected). The output is in the end of the post. It is a bit hard to read. If you know any other way to do a repeated measures ANOVA using Python please let me know. Also, if you happen to know that you can create nicer plots with Pyvttbl I would also like to know how! Please leave a comment. Update (2017-07-03): If your installed version of Numpy is greater than 1.11.x, you will run into a Float and NoneType error. One quick solution for this is to downgrade Numpy to 1.11.x. I created a post, Step-by-step guide for solving the Pyvttbl Float and NoneType error, in which I show how to install Numpy 1.11.x in an virtual environment. This way, you can run your ANOVAs, without having to uninstall Numpy. Source Type III eps df MS F Sig. et2_G Obs. SE 95% CI lambda Obs. Hi there. Thanks for your excellent blog. I’m trying to run a two-way repeated mesures ANOVA using pyvttbl as you explain. I use python 2.7 and installed pyvttbl via pip. I was able to import pyvttbl and create the dataframe just fine. However, when I run the test, I get this error: TypeError: unsupported operand type(s) for +: ‘float’ and ‘NoneType’. Can you help? Thanks in advance! Have you solved the problem? When I wrote this blog, this did not happen. However, I tried to run the script again and get the same problem. I am not sure what is going on here but I will try to find out given that you did not solve it. Please let me know if and how you solved the problem. I’ve had the same error but by googling it, I found a similar issue with the library py-faster-rcnn (https://github.com/rbgirshick/py-faster-rcnn/issues/481#issuecomment-278709605). You have to uninstall the current version of numpy and install numpy v1.11.0. For me, it works ! Thanks for leaving your comment here, Damien! I will update the posts later and reference to your solution. But it returned the error “unsupported operand type(s) for +: ‘float’ and ‘NoneType'”. I have checked my data file and found Z_score was stored as numpy.float64. Is it the reason I have this error message? Should I change my data from numpy.float64 to long or other data type?